"Thank you for sharing The Asking Formula. It has become a part of our culture"
Immediately implement the most effective, straightforward and high-impact process for structuring best-in-class persuasive communications and allow you to achieve your objectives. Instill into yourself a bias for action that gets things done. Super-charge your communications effectiveness and influence. Improve results in your professional and personal life. organization’s ability to deal with change more effectively, more consistently and more rapidly? 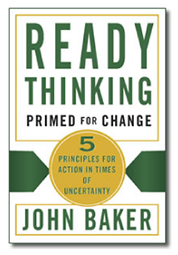 READY Thinking, five principles that allow you to win when faced with change. 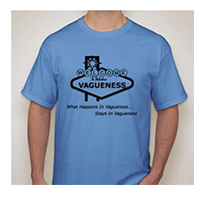 Be the envy of your peers with the “What Happens In Vagueness… Stays in Vagueness” limited edition T-shirt, featuring one of the more popular sayings John uses in his Keynotes and Workshops. Available in all sizes and in any color as long as it’s blue. Buy one for yourself and get one for your entire team! Got the book? Get the companion worksheet tablet. 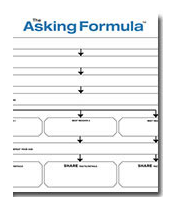 Each tablet provides you 15 blank Asking Formula worksheets for use in formulating your best possible ask! 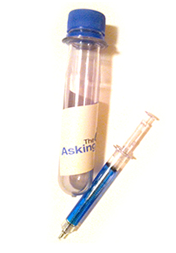 Who couldn’t use a dose of Asking Formula at a critical moment? This cool working pen is hermetically sealed inside an indestructible laboratory test tube. Ready when you need it.